On October 31st in 2010, Detroit Red Wings forward Darren Helm dressed up as his locker room stallmate and sometimes linemate Todd Bertuzzi, complete with matching fake tattoos courtesy of Jeff Shea at Wholeshot Tattoo and favorite pieces from the veteran's wardrobe. Triple-taken by the sight of Helm when arriving at the team's Halloween party, Bertuzzi described the costume and ensuing impersonation as "awesome", noting "he's a good kid and he did a really good job". 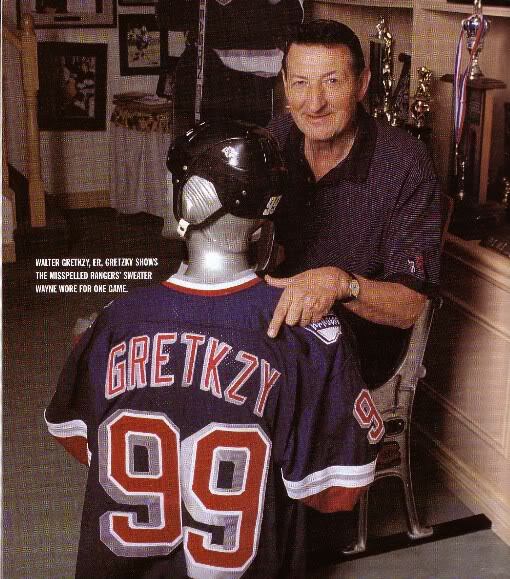 On October 30th in 1997, New York Rangers forward Wayne Gretzky skated in a game against cross-river rival New York Islanders at Nassau Coliseum with his name mispelled "Gretkzy" on the back of his jersey. 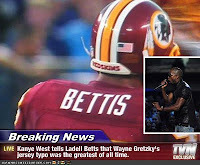 Far from an isolated incident in the world of sport with typos and misspellings abound, rarely does it involve the sports greatest player of all time skating for one of the league's highest profile teams. 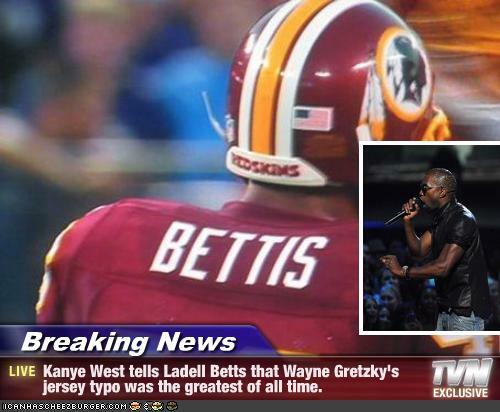 Even rapper Kanye West agrees this is the greatest jersey foul of all-time. The Islanders beat the Rangers that night by a score of 5-3. 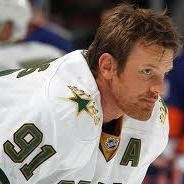 On October 28th in 2010, Dallas Stars forward Brad Richards fired a blistering center ice slapshot over Los Angeles Kings goaltender Jonathan Quick and through the glass with three minutes remaining in the final frame. The Kings topped the Stars that night 5-2 before the then-smallest crowd in Dallas Stars history, announced as 11,306 but closer to 5,000, owing in part to fans staying home to watch their Major League Baseball city sibling Texas Rangers play in Game 2 of the World Series. 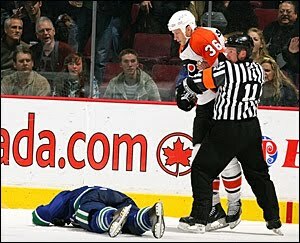 On October 27th in 2007, Philadelphia Flyers defenseman Randy Jones brutally boarded Patrice Bergeron face-first into the glass, leaving the Boston Bruins forward unconscious with three minutes remaining in the first period. 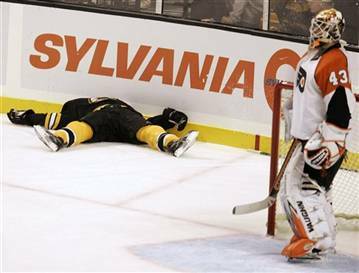 Bergeron exited the ice strapped to a stretcher, having suffered a broken nose and concussion on the play, and missed the remaining 72 games of the season. An apologetic Jones was assessed a five minute major and a game misconduct to which the NHL added a two game suspension, forcing the Flyer to forfeit $5,614.98 in salary. Philadelphia beat Boston that night 2-1. On October 24th in 2009, Philadelphia Flyers captain Mike Richards blindsided winger David Booth with a vicious hit to the head rendering the Florida Panthers forward bloodied and unconscious. Booth left on a stretcher and missed the next 45 games owing to a concussion incurred on the play. Richards received a five minute major and ten minute game misconduct but was not subsequently fined or suspended for the act. Philadelphia beat Florida that night 5-1. Five months later the NHL outlawed such blindside hits in order to reduce head injuries. 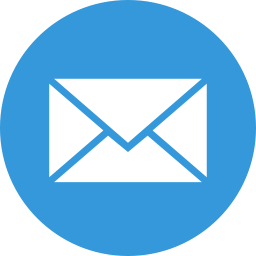 The language of the law is captured in Rule 48. On October 23rd in 2008, Boston Bruins power forward Milan Lucic delivered a crushing check against Toronto Maple Leafs defenseman Mike Van Ryn shattering the TD Garden glass early in the second period of play. Neither player was injured during the incident though a few front row fans were cut by glass. Toronto beat Boston that night by a score of 4-2. On October 22nd in 1997, Wayne Gretzky's wife Janet Jones was bloodied and knocked unconscious when a heavy hit by New York Rangers defenseman Ulf Samuelsson on Chicago Blackhawks forward Sergei Krivokrasov dislodged a large pane of plexi-glass striking the 36 year old actress. 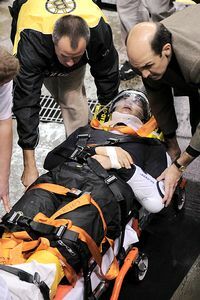 Jones was treated by team doctors before being carried out of Madison Square Garden on a stretcher and transported by ambulance to St. Luke's-Roosevelt Hospital where she spent the night, diagnosed with a mild concussion and receiving several stitches in her lower lip. 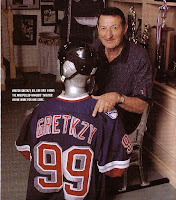 Gretzky finished the final six minutes of the game before joining his wife. The Blackhawks shutout the Rangers that night by a score of 1-0. 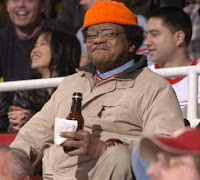 On October 21st in 2010, the Detroit Red Wings honored the recent passing of 38 year season ticket holder and super-fan Kenneth Rucker, a retired Chrysler forklift driver who suffered a fatal heart attack at the age of 63. Recognized by the Joe Louis Arena faithful simply as the "Orange Hat Guy", Rucker was often featured on the scoreboard screen during Red Wings home games accompanied by R.E.M. song "Orange Crush". 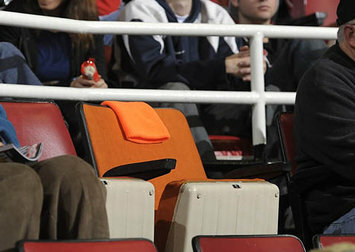 In honor of Rucker's decades of unwavering support for the club, ownership elected to reupholster his season's seat (section 112, row 7, seat 5) from Red Wing red to Rucker orange for the remainder of the 2011 season. In addition to setting a new high water mark for fan appreciation, Detroit outclassed the Calgary Flames that night by a score of 4-2. On October 20th in 2005, Vancouver Canucks voices John Shorthouse and Tom Larscheid won $20,000 in the 50/50 draw benefiting local charities for children during a home game against the Phoenix Coyotes. Having played the popular lottery at every Canucks home game since they began working together in 1998, the giddy pair celebrated their first ever 50/50 win with four minutes remaining in the third period. An audio clip of their unbridled excitement can be heard here. Despite rumors spread by morning radio mouthpiece Neil MacRae suggesting the pair engaged in fisticuffs over the winnings, Shorthouse dispelled the nonsense explaining "there was enough hugging between two grown men to make even the cast of Will & Grace uncomfortable". The Canucks beat the Coyotes 3-2 that night in what Shorty described as "the greatest night of hockey ever at GM Place". 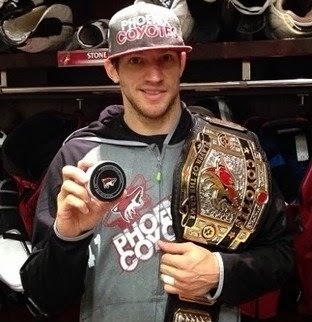 On October 19th in 2013, Phoenix Coyotes goaltender Mike Smith gloved a Mikael Samuelsson wrist shot with three seconds to play and promptly fired it 190 feet into the Detroit Red Wings empty net with 1/10th of a second remaining to become the 11th netminder in NHL history to be credited with a goal. Coyotes assistant GM Sean Burke was not surprised by the goal having seen Smith's swagger and puck-handling prowess firsthand, "I’ve told people before, he’s going to score a goal at some point – and he’s probably not done. He’ll score again. The way he fired that puck last night, if you gave him 25 pucks, he can do that 25 times. It’s not just a guy who got lucky and it went in. He can do that consistently.". 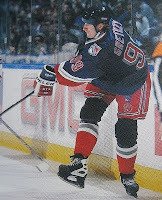 Afterwards, Smith relived his minor league marker on October 22, 2002 against the ECHL's now defunct Dayton Bombers and reflected on his first NHL goal, "I do shoot the puck quite often in practice but a lot of things have to go right in order for that to happen ... the clock has to slow down at the right time of the game to let it trickle in over the line." Mike Smith's historic goal capped the Coyotes comeback win over the Red Wings who led 2-0 through 39 minutes before Phoenix scored five unanswered goals to ultimately defeat Detroit by a score of 5-2. Four years later at the NHL All-Star Game in Los Angeles, Smith once again showcased his shooting skills making an impossible shot from 200 feet away, proving the first wasn't a fluke. 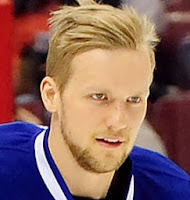 On October 19th in 2013, Vancouver Canucks defenseman Alex Edler fired an 83 foot center ice slapshot past Pittsburgh Penguins goaltender Marc-Andre Fleury to open the scoring during a Saturday matinee at the Consol Energy Center. Fresh off a three game suspension for hitting San Jose Sharks rookie sensation Tomas Hertl, the Swedish blueliner's first period longbomb befuddled a fragile Fleury still reeling from an embarrassing playoff pull. The Flower ended the afternoon stopping 36 of 39 shots as well as Edler's second round shootout attempt, a wrist shot from 10 feet out. The Penguins went on to beat the Canucks by a score of 4-3, extending Fleury's early season undefeated streak to seven games. On October 19th in 1991, Gino Odjick collected the first goal of his sophomore campaign and likely the most famous of his 64 regular season scores on a penalty shot against Conn Smythe winner Mike Vernon. The opportunity arose when Hall of Fame defenceman Al MacInnis was flagged for fouling the Algonquin Enforcer as he sped by him. The goal was the Canucks' fourth en route to a 5-2 victory over the Flames. * See also Today In NHL History - Gino Odjick. * See also Today In NHL History - Gino Odjick Runs Hasek. * See also Today In NHL History - Gino Odjick Fights Blues. 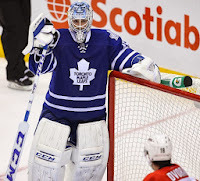 On October 17th in 2013, Toronto Maple Leafs goalie Jonathan Bernier flubbed a 174 foot clearing attempt that bounced off the end boards before deflecting off his skate and into the net, giving the Carolina Hurricanes a 3-2 lead with seven minutes to play. The miscue was awarded to Hurricanes' defenseman Ron Hainsey with an assist to netminder Cam Ward, but credit goes to hard-charging forward Radek Dvorak who won the skating race to eliminate icing on the play. Despite the boos that rained down on the recently acquired backstop brawler for his blunder, HNIC's Don Cherry insisted the costly goal was a product of the NHL's confusing new hybrid icing rule. In the post-game interview Bernier conceded "It was just a bad mistake on my part, the puck was probably spinning a lot, and I just misjudged it". When asked if hybrid icing played a role in the mishap, Bernier noted "That's the new game, so we've all got to adjust". Bernier's own goal stood as the winner as Carolina beat Toronto 3-2. On October 17th in 2002, 21 year old Lethbridge College student Timmy Hurlburt flubbed an attempt to streak the Saddledome surface with five minutes remaining in a Boston Bruins/Calgary Flames matchup. Acting on a $200 dare, Hurlburt successfully scaled the nine foot glass clad solely in red socks and a wrist-watch only to botch the descent. Landing off-balance, Hurlburt's head struck the ice rendering his untanned naked mass unconscious and in plain view for all to see during the ensuing six minute delay. 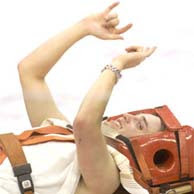 Hurlburt signaled his return to consciousness with a pair of hand-gestured horns whilst exiting the rink secured to a stretcher to the rousing approval of onlookers and his born-again Christian mother's chagrin. The game ended in a 3-3 overtime draw. Timmy was released from the hospital the next day. 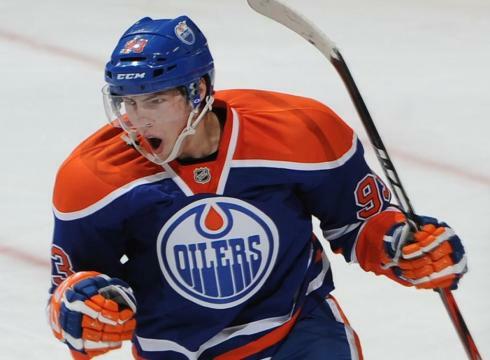 On October 15, 2011, Edmonton Oilers forward Ryan Nugent-Hopkins was credited with his first NHL hat trick despite video evidence to the contrary, showing the third goal belonging to linemate Taylor Hall. Too good a story to pass up for the top pick of the 2011 Draft in just his third NHL game, the hometown scoring decision stood. In the end, the oldest player on the ice spoiled it for the youngest with veteran Sami Salo netting the winner and completing his own Nugent-Hopkins hat trick (two goals and an assist), giving Vancouver a 4-3 win over Edmonton. With the 7th overall pick of the 1995 Draft forward Shane Doan still seeking his first NHL hat trick despite skating in 1,162 games to date and scoring two goals 38 times, it appears the Coyotes captain will have to actually score three times in a single game to earn the honor unlike the 18 year old Nugent-Hopkins who had it gifted to him in his first week. 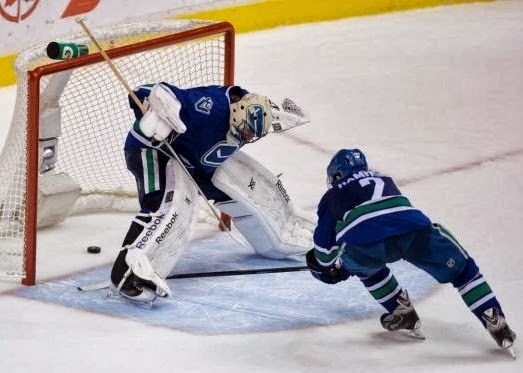 On October 12th in 2013, Vancouver Canucks defenseman Dan Hamhuis misplayed a breakout from behind his net, deflecting the puck off both of Roberto Luongo's skates and into the net for an own goal, giving the Montreal Canadiens a 2-1 lead with four minutes to play in the middle frame. The bizarre miscue, coined by NHL goalie turned Hockey Night In Canada commentator Kelly Hrudey as "one of the strangest goals you'll ever see in hockey", was credited as a shorthanded goal for Canadiens' forward Lars Eller, the Dane's fifth marker in as many games. Asked about the gaffe in the post-game interview, Luongo noted "I didn't see it, I don't know what happened". When asked if he had ever given up a more bizarre winning goal, Luongo made clear "I didn't give that up". The Canadiens scored two more goals to beat the Canucks 4-1. 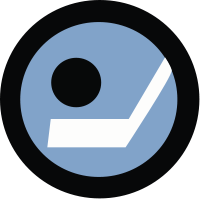 On October 11th in 1952, the Canadian Broadcasting Corporation presented the first ever publicly televised hockey game. The match, shown on the Saturday evening Hockey Night In Canada series, featured the Montreal Canadiens and Detroit Red Wings from the Montreal Forum. This inaugural HNIC telecast was carried on the CBC's French channel (SRC) with play-by-play offerings from announcer Rene Lecavalier. Montreal doubled Detroit that night 2-1. The first telecast from Toronto followed three weeks later. On October 11th in 1953, Gordie Howe recorded his first ever Gordie Howe Hat Trick accumulating a goal, assist, and a fight in the same game. Despite defining the deed, the four-time Cup champ ('50, '52, '54, '55) and six-time Hart ('52, '53, '57, '58, '60, '63) and Art Ross ('51-'54, '57, '63) recipient turned only two such tricks and wasn't the first to do it. 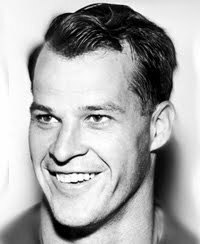 Mr. Hockey's inaugural occurred when he scored, assisted on a Red Kelly goal, and fought Fernie Flaman in a 4-0 Detroit Red Wings win over the Toronto Maple Leafs. His other came in the same season when the teams met again on March 21, 1954, scoring, assisting on a pair of Ted Lindsay tallies, and fisticuffing with Ted Kennedy in a 6-1 victory. The first ever Gordie Howe Hat Trick is credited to Harry Cameron of the Toronto Arenas who collected the components some 36 years earlier on December 26, 1917 in a 7-5 win over the Montreal Canadiens. Brendan Shanahan is widely believed to lead the category with 17 though uncertainty exists owing to incomplete statistics on the accomplishment. On October 10th in 2007, Jesse Boulerice added another chapter to his checkered past and the violent history of the Philadelphia Flyers when he blindsided Ryan Kesler with a vicious cross-check, breaking his stick across the forward's face. Boulerice was assessed a 10 minute match penalty on the play to which the NHL tacked on a 25 game suspension, then tied for the longest suspension in league history, costing him $63,502.75 in pay. Acknowledging that he crossed the line, Boulerice apologized to Kesler after the Flyers 8-2 victory over the Vancouver Canucks. On October 7th in 2013, Los Angeles Kings goalie Jonathan Quick misplayed a 163 foot shorthanded clearing attempt, dropping his stick and inadvertently directing the puck into the net with his blocker for an own goal, giving the New York Rangers a 3-1 lead four minutes into the final frame. The miscue was credited to Rangers' defenseman Ryan McDonagh, his first point of the season and 13th career NHL goal. 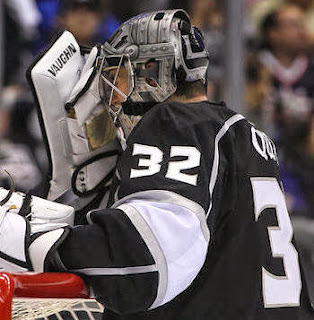 With five minutes remaining, the Los Angeles Kings' fair-weather faithful jeered Quick as he successfully stopped an iced puck. Unamused by the gesture, the Conn Smythe winner and Stanley Cup champion flipped-off the ungrateful onlookers waiving his glove in response. In the post-game interview Quick conceded "everybody gives up bad goals, it's part of the game". When pressed for more detail on the miscue Quick quipped, "you guys are writing a story on that one goal?" which the reporter denied while hockey bloggers everywhere nodded. When asked for comment about any post-gaffe discussions with his goalie, Coach Darryl Sutter responded "He dropped his stick - what do you want to talk about - tell him not to drop his stick?". Sutter buttoned his remarks, joking "It's his job to stop the puck, so obviously he didn't think he needed a stick". The Rangers beat the Kings 3-1.